To make natural gas and biogas suitable for use, the methane has to be separated from the CO2. This involves the use of membranes, filters that stop the methane and allow the CO2 to pass through. Researchers at KU Leuven (University of Leuven), Belgium, have developed a new membrane that makes the separation process much more effective. When extracting natural gas or producing biogas, it's all about the methane. But methane is never found in its pure form. Natural gas, for instance, always contains quite a bit of carbon dioxide, sometimes up to 50 percent. To purify the methane—or, in other words, to remove the CO2—industry often uses membranes. These membranes function as molecular sieves that separate the methane and the CO2. The methane can then be used as a source of energy for heating, for the production of chemicals, or as fuel, while the CO2 can be reused as a building block for renewable fuels and chemicals. Existing membranes still need to be improved for effective CO2 separation, says Professor Ivo Vankelecom from the KU Leuven Faculty of Bioscience Engineering. "An effective membrane only allows the CO2 to pass through, and as much of it as possible. The commercially available membranes come with a trade-off between selectivity and permeability: they are either highly selective or highly permeable. Another important problem is the fact that the membranes plasticise if the gas mixture contains too much CO2. 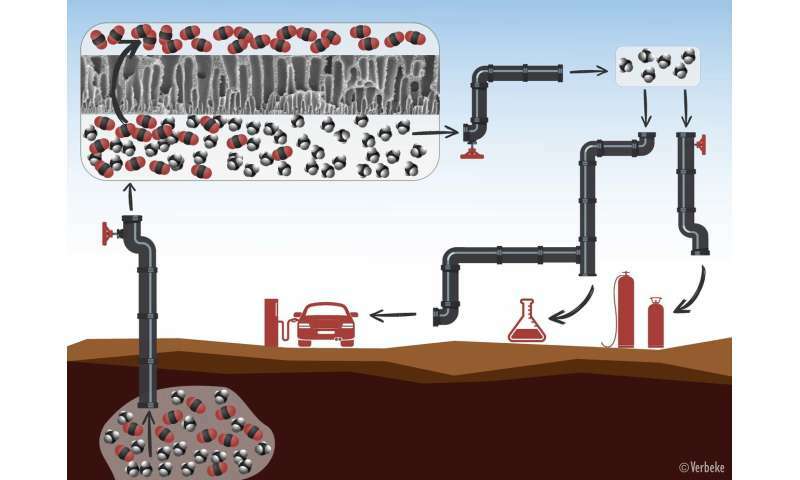 This makes them less efficient: almost everything can pass through them, so that the separation of methane and CO2 fails." The best available membranes consist of a polymeric matrix containing a filler, for instance, a metal-organic framework (MOF). This MOF filler has nanoscale pores. The new study has shown that the characteristics of such a membrane improve significantly with a heat treatment above 160 degrees Celsius during the production process. "You get more crosslinks in the polymeric matrix—the net densifies, so to speak, which improves the membrane performance, because it can no longer plasticise. At these temperatures, the structure of the MOF—the filler—changes, and it becomes more selective. Finally, the high-temperature treatment also improves polymer-filler adhesion—the gas mixture can no longer escape through little holes at the filler-polymer interface."